Why is it your business if identity theft victims can get free personal recovery plans and other help that makes it easier for them to report and recover from identity theft? Here’s an answer: Because it’s good business – for you, your customers, your employees, and your community. Identity theft affects millions of people each year. You might see its telltale signs when a customer calls about an unauthorized charge, the IRS contacts you about a suspicious tax form, or an employee is upset, distracted, and spending lots of time on the phone. However it shows itself, identity theft can be financially and emotionally draining, and take time and energy for victims to resolve. Wouldn’t it be better if they could be using that time and energy helping your business grow? That’s why an announcement today from the Federal Trade Commission is a big deal, and a good deal, for your business. pre-fills letters and forms they need to help resolve the identity theft with credit bureaus, businesses, debt collectors, and the IRS. The entire website is available in Spanish, too, at RobodeIdentidad.gov. What can your business do to help? Spread the news about IdentityTheft.gov. Tell employees about IdentityTheft.gov. Perhaps send a company-wide email with the short video below about the site. You might also want to consider naming a trusted member of your HR team to talk to employees about ID theft prevention. 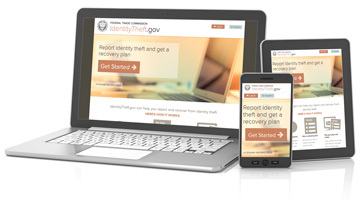 Publicize IdentityTheft.gov to your customers. Many businesses have a protocol in place for working with consumers who call about unauthorized charges or unapproved accounts. Consider adding the simple step of mentioning IdentityTheft.gov. Your business can be part of the solution, and change a distraught consumer into a loyal customer. Talk about identity theft prevention and recovery in your community. Everyone knows someone who has been the victim of ID theft. That’s why identity theft prevention and recovery can be a perfect pet project for your industry association or community group. Give away something for nothing! We have free bookmarks that you can share with employees, customers, and at community events. Use them to spread the word. I have been a victim of identity theft for over 10 years and feel I still am I didnt know what to do or who to contact and still don't haven't been able to buy a car home start a business take a vacation obtain a credit card or even finance furniture or clothes for my children while growing up so I have worked hard and struggled most my life and now I'm disabled and can't get any help from the government but God has provided what I have had to have but will never understand how our government doesn't help me and others who are struggling to get by in this country.